This billboard, advertising Hell Pizza (who named many of their pizzas after the seven deadly sins) features an image of the half-completed $30 million mansion of financier Mark Hotchin. In 2009 there was considerable public disquiet that construction on the mansion had continued while his company, Hanover Finance, was in a state of collapse, threatening many investors with significant losses. At first Hell Pizza created a mobile billboard advertising 'Greed' pizza next to a picture of Hotchin, which was driven around Auckland and parked outside construction site. 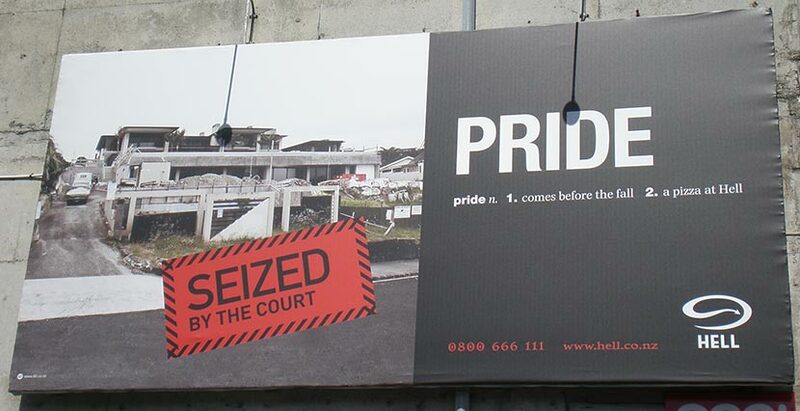 Later, the courts stepped in and seized the property; so the new poster advertised 'Pride' which 'comes before the fall'.